I just finished a session of Modern Warfare 2 and noticed that the PC version of GTA IV, via Steam, currently has 75% off the retail price. That's �19.99 reduced to �4.99 (.49, �7.49). Now is definitely the perfect opportunity to pick up a copy in time for Christmas if you don't already own it! Be quick though, the offer ends in just under a couple of days time (4PM GMT) Christmas Eve. Check out the offer within the Store section of your Steam client, or head over to this page. Also perhaps of interest is the "Rockstar Collection" which has 33% off until 3rd January, bringing the price down to �33.49 (.89, �40.19). The collection includes all these excellent games. 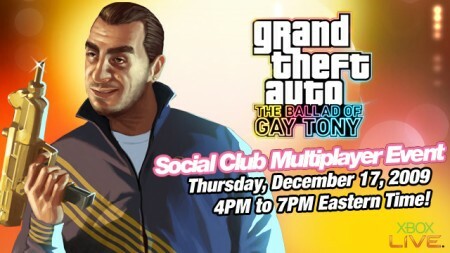 If you're unable to join at that time then you can still watch all the action on a live stream on the Social Club!